You need to look for the Bluetooth headphones that come baked in with a boom mic. If you do not know what a boom mic is – we have a short answer in layman terms – a mic which is near enough to comfortably receive the audio attached to a pole like structure (an extension). Now that you know what is a boom mic, should you get the best Bluetooth headphones with boom mic? Fret not; Bluetooth headphones with boom mic are not super expensive! Well, some of the Bluetooth headsets with boom mic are expensive. But, you do not necessarily need an expensive Bluetooth headphone with mic unless you are a very serious or popular professional. Normally, gamers need a Bluetooth headset with microphone for in-game communication and so do YouTubers for live gaming sessions. You may also be needing it if you are working at a support center in any industry where you need to connect to your clients via voice chat. So, having the best Bluetooth headsets with boom mic would be a bonus! But do you know a perfect choice for the Bluetooth headphones with a mic? 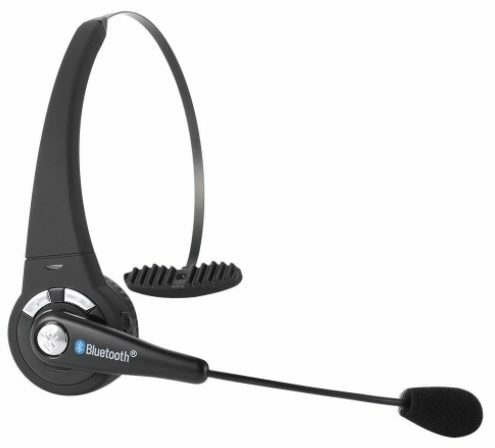 Ever asked yourself which are the best Bluetooth headsets with boom microphone? If you are looking for such headphones which come baked with the boom mic, without further ado, let us get to know them! The AGPtek 2 in 1 stereo headset is a budget headphone with a boom mic. It comes with a price tag of $28.99. It does offer noise canceling and claims to reduce four times the impact. You also get a touch button to answer or end a call, redial, and you can also utilize the volume button in a single touch. This may not be the best Bluetooth headset ever, but it is a durable product. And, indeed, it is one of the best Bluetooth headphones with Boom Mic. Specifically, the AGPtek is for the consumers who are looking to get something for their old PC (outdated mostly). 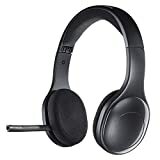 The reason being – you will not find a lot of headphones with Bluetooth 2.1 support. So, it should be a great pick if you are someone with an older system or device. The TurnRaise Bluetooth trucker headset is a nice product for a specific group of people. 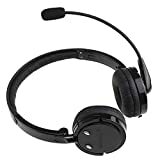 If you are someone who wants a light yet a cheap headset with boom microphone, to give instructions while you work, Bluetooth Trucker Headset is the over the head Bluetooth headphone that you need. This Bluetooth headset comes with a price tag of $19.99. It offers high-quality sound at such a low budget. It also features a superior noise cancellation technology to make the most out of the investment you did for the headset. 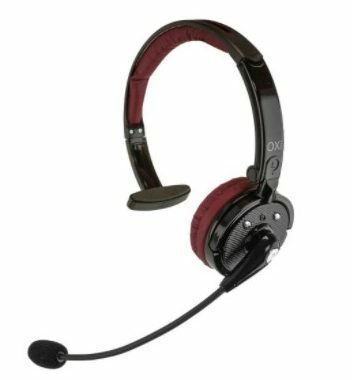 So, in essence, it is one of the best bangs for the buck headset with boom microphone. It indeed is one of the best Bluetooth headsets with Boom Mic. Bluetooth Trucker Headset can last up to 8 hours with continuous talk time and could last you around 250 hours on standby. It really is a good choice for Bluetooth headset considering the price! Also, do note that you will not be able to listen to music with this one, just listen to the voice (for a conversation and talk back). 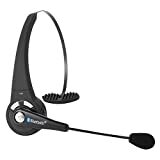 HANDS FREE BLUETOOTH - Connect the Oxi Bluetooth Headset to your smartphone, tablet, laptop or vehicle SYNC function for seamless Skype calling, phone calls while traveling, or even home video gaming use. ENHANCED NOISE CANCELLATION - Not only can you enjoy HD-quality calling with crystal-clear voice communication, our headphones are made to block out loud noises and sound for better information relay. ADJUSTABLE COMFORT - Featuring swivel-cushioned ear pieces, and adjustable band and a flexible boom mic, you can wear the Oxi headset for hours without it feeling uncomfortable or causing you to sweat. EXTENDED TALK TIME - The battery life on this headset lasts up to an amazing 21 hours with up to 250 hours of standby time. And the touch-button calling, redialing and volume features make it easy to use for hours at a time. VERSATILE CONNECTIVITY - Each headset connects to up to two other Bluetooth devices simultaneously, allowing you to connect to speakers, your car, your phone or other important mobile devices for multiple needs. The Oxi Hands-Free Bluetooth headset is a decent headset with boom mic. Similar to the previous one, you cannot listen to music with this. It is indeed one of the best Bluetooth headsets under $50. To be precise, it comes with a price tag of $36.99. It offers high-quality sound at a lower budget. It offers enhanced noise cancellation which lets you have a great audio experience even with noises around your surroundings. If you want a Bluetooth headset without the ability to listen to music, this could be one of the coolest of the lot. It indeed is one of the best Bluetooth headsets with a Boom mic. It can last up to 21 hours with continuous talk time and could last you around 250 hours on standby. Oxi Hands-Free Bluetooth Headset is really good considering the price! It also lets you connect to two different Bluetooth devices simultaneously, so that should come handy! Check this out. 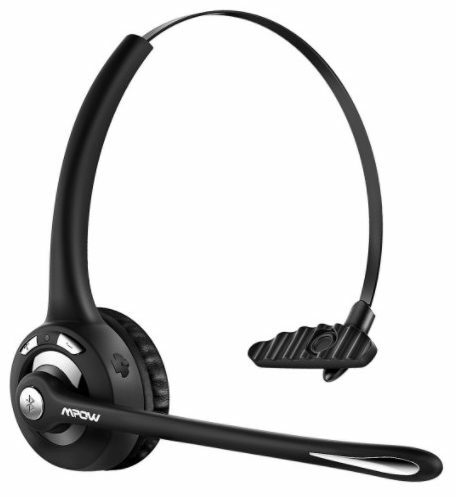 The Mpow Pro Truck Driver Bluetooth headset is a great pick for the ideal purpose. Again, similar to the previous one, you cannot listen to music with this. 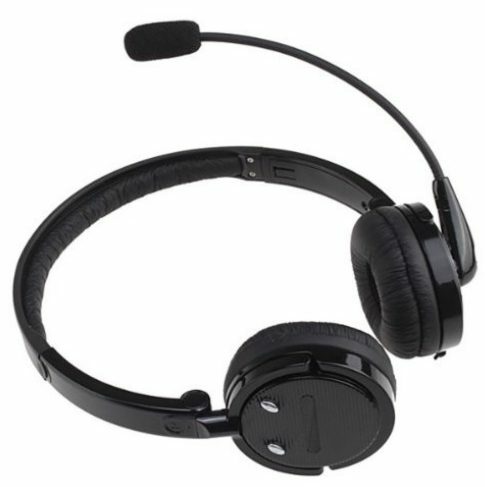 It is indeed one of the best Bluetooth headsets with boom mic under $50. To be precise, it comes with a price tag of $19.99. Also, it is one of the best sellers on Amazon. It offers high-quality sound at a very low budget. You will not find an impressive noise cancellation technology with this one. But, if you are searching for a Bluetooth headset for personal use (mostly used in a room), then this could do the trick. It indeed is one of the best Bluetooth headphones with Boom Mic. It can last up to 12 hours with continuous talk time and could last you around 250 hours on standby. Aren’t you getting a lot with a Bluetooth headphone just under $20? Similar to the previous product, the Mpow Pro truck also supports connecting to two different Bluetooth devices at the same time. Read more about this Bluetooth headset. Never Miss a Call: When you're on the go or in a noisy location, it's almost impossible to take a call. But our Wireless Bluetooth Headset features Noise Canceling technology and filters nearly all background noise, allowing you to talk and listen with improved clarity. 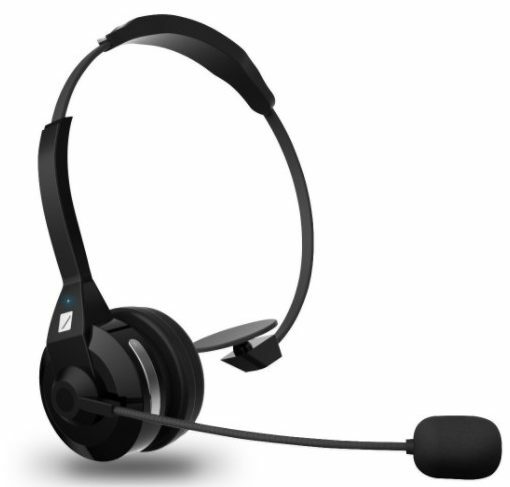 Connect to Two Devices: Multipoint capability allows our Headset to connect with two Bluetooth audio devices simultaneously and provides an incredible range of 33 feet. With a built-in microphone, you'll have hands-free calls for your smartphone, Skype, or MSN. Long-Lasting Reliability: For your convince, our Headset's built-in battery lasts for 30 hours of talk time or a remarkable 900 hours of standby time. And because it connects quickly to Bluetooth enabled devices, you're ready to answer a call virtually anywhere. Premium Quality: Lightweight and durable, the Bluetooth Hands-Free Headset is built to last and ideal for travel. The over-the-head design is very comfortable and can be worn over either the right or left ear. With an adjustable size strap, finding the best fit is easy. Three Month Warranty: At FRiEQ, we're continuously developing innovative products and keep customer satisfaction as our number one priority. To ensure that you receive a product you're happy with, each purchase is back with our three-month warranty. The FriEQ Bluetooth headset is a great pick if you want a noise canceling wireless Bluetooth headset with boom mic. Again, similar to the previous one, you cannot listen to music with this. It is indeed one of the best Bluetooth headsets under $50. To be precise, it comes with a price tag of $49.99. It offers high-quality sound at a very low budget on a budget price. Similar to one of the products mentioned above, you can connect to two different Bluetooth devices at the same time. It indeed is one of the best Bluetooth headphones with Boom Mic. It can last up to 30 hours with continuous talk time and could last you around 900 hours on standby. Aren’t you getting a lot just under $50? Yes, you should definitely check out this. Do note that it isn’t a Bluetooth headset! 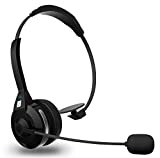 We kept this recommendation only for the people out there looking for a perfect headset under $200 with boom mic and on which you can listen to music as well! 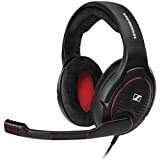 The Sennheiser GAME ONE Bluetooth headset is a great pick for the people who want a headset for in-game communication. However, with this one, you can listen to music as well. It is indeed one of the best Bluetooth headsets under $200. To be precise, it comes with a price tag of $169.95. Of course, it is a pricier offering considering the facilities. Also, a Sennheiser product undoubtedly delivers a great audio experience. As you can observe the image above, it comes with a great design language which looks quite cool and houses durable materials as well. It indeed is one of the best Bluetooth headphones with Boom Mic. Check it out here. Do not be disheartened with the recent recommendation! You do have wireless headsets on which you get a boom mic and can listen to music as well. Well, Although you may find fewer products satisfying the same, the Logitech H800 is one of the best you can find around. It comes with a price tag of $63.99. Normally, Logitech products are durable enough. And, so is the case for H800 wireless headset. The speaker drivers featured here are laser-tuned for an accurate audio experience. Also, it offers a whopping 40 ft. Wireless range, which makes things so much easier! The noise cancellation for the boom mic is pretty decent considering it as a quality headset just under $100. It also offers on-ear controls to let you easily use it. You get a six-hour rechargeable battery with this one. However, you can choose to charge via USB quickly when required. Which is the Best Bluetooth Headphone with Boom Microphone? Well, there are numerous Bluetooth headsets with a boom mic. However, the number of products available might confuse you to make a wrong decision. So, we’ll recommend sticking to the Bluetooth headphone products mentioned above. Also, we featured the best brands available out there! What more could you expect for a headset with boom mic? Have you already tried any of the above-mentioned Bluetooth headphones with boom mic? Do you want to share your experience with any of the product above? Let us know your thoughts in the comments section below. I am really confused, which one is should tech. I need to take call from home. 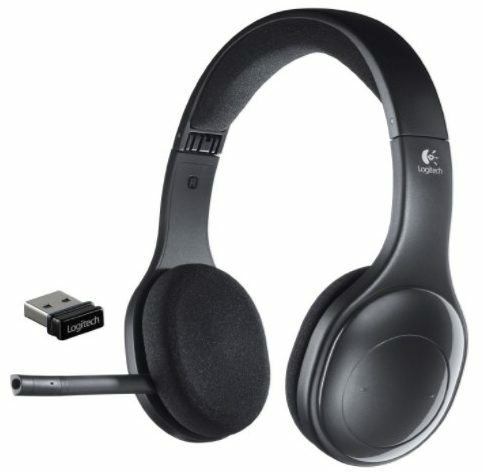 looking for some comfortable headset for long calls. waooo amazing headphones shared by admin. i like this type of headphones. i also using it. their voice are so soft and amazing to listen easily. Great reviews of best Bluetooth headphones. I love AGPtek and will definitely buy this one. I want to add some extra feature i have found when i search more about it. Foldable, Built-In Microphone, Rechargeable, Blocks 4 times the external noise Noise canceling Crytal clear sound with DSP High performance with Bluetooth 2.1. Thanks again Abhishek for sharing a well-arranged best Bluetooth headphones. 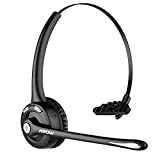 I liked Mpow Pro Truck Driver Bluetooth Headset, just because of its low cost, further it has Superior 4X Noise Cancelling. What about Mrshall bluetooth headphones? Great explanation. I really liked these headphones. I’m gonna buy one from here. Thanks for sharing such a great article. It helped me a lot choosing the headphone.